DELAWARE - Buckeye Firearms Association is pleased to announce its endorsement of House Bill 203. The bill's primary sponsor, Terry Johnson (R-McDermott), has again taken lead in improving firearms laws in the Ohio House. HB203 has significant support as indicated by the bill's 15 co-sponsors. The NRA has also endorsed the legislation. HB 203 seeks to make many improvements to Ohio's concealed carry laws. The bill would strengthen the background checks required to obtain an Ohio Concealed Handgun License (CHL). Under the bill, Ohio CHL applicants would be a National Instant Check System (NICS)-compliant background check, making it compatible with more states. This improvement will also help prevent people with mental health disqualifiers who have been entered into the federal database from obtaining a CHL. The bill would also move Ohio to an automatic reciprocity system, relieving the Attorney General from needing to sign agreements with every state to facilitate reciprocity. The Attorney General would still be permitted to sign agreements if needed, but the bill seeks to streamline the process and open up agreements with states like Indiana, Pennsylvania, and Georgia that Ohio doesn't currently have agreements with. "Reciprocity remains a critical issue for people with a CHL," said Jim Irvine, Chairman of Buckeye Firearms Association. "Background checks have been a hot topic since the Newtown killings, and ours has some issues that should be addressed. This bill makes sure people with disqualifying offenses are not issued CHL's, which helps open up reciprocity agreements. This is something everyone should be happy about." The bill would also update the requirements and disqualifications to obtain an CHL. Currently there are different standards to possess a gun under federal and state law, and different still to obtain a CHL. HB 203 harmonizes Ohio law with federal law so that someone who is prohibited under federal law from possessing a firearm will not be issued a CHL. Ohio would also be able to issue licenses to out-of-state residents, something many other states already do. Under the bill, the current topics required for Ohio CHL training would remain, but the mandate that an instructor spend 12 hours covering the topics that can be covered adequately in less time would be deleted. 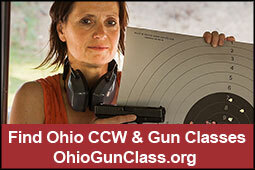 "Ohio has one of the nation's most egregious training requirements to obtain a CHL," observed Irvine. "Other states have seen that more people get training when the state requirement is reduced. We are strong advocates of training and want to see more people become trained in the safe use of firearms. This bill facilitates that goal." Finally, HB 203 seeks to modify the state's self-defense law. Current law specifically states that a person has no duty to retreat before using deadly force if that person is in their own home or automobile. HB 203 would expand that to anyplace that a person lawfully has the right to be. "The law should not impose specific 'duties' on people whose lives are in jeopardy," observed Sean Maloney, BFA Region Leader and a Cincinnati-area attorney. "It should protect the innocent, and their right to defend their own life from criminal attack. The bill would not otherwise change the threshold to use lethal force in defending one's life." HB 203 is a collection of common-sense firearms law reforms. It also corrects problems with our current background checks and brings Ohio laws more in line with federal laws. It continues Ohio on a path to improving our laws by making life easier for the law-abiding gun owner. The bill will receive its first hearing on Tuesday, June 18, before the House Committee on Policy and Legislative Oversight, which is chaired by BFA "A" -rated Rep. Mike Dovilla (R). The hearing will be held at 2:00pm in Room 115.